Yesterday I left Kate with the sitter fully confident that they were headed to lunch. I had waked her moments before Cindy arrived. When she walked in, I said, “Your Monday lunch date has arrived.” Kate greeted her warmly. I left feeling like I had set things up beautifully and that they would have good time at lunch while I was at Rotary. The big surprise came when I arrived home. Kate and Cindy were seated in the family room. Kate was looking through a TCU magazine. I got the impression that she had just opened it. I asked about lunch, and Cindy said they never got to lunch. Kate told her she wanted to rest. She apparently did so until near the time I got home. I walked Cindy to her car and told her I was disappointed that Kate had not had lunch and that she had napped so long. I started to encourage her to be more assertive with her next time. Then she said she tried several times to get her up, but Kate preferred to rest. I told her that she did the right thing. I didn’t want her to force her. She suggested that next time I might walk to the car with them and that she might be more responsive to me than to her. I’ll think about that. I do think this particular sitter is a bit timid. I am sure the person she replaced would have gotten her there. After Cindy left, I figured that Kate would be ready to get out of the house. It didn’t happen. She said she wanted to rest. She proceeded to rest for another hour before we left for dinner. When we returned from our Monday night Mexican meal, she worked puzzles for about an hour. Then we adjourned to our bedroom where she spent another hour looking through the “Big Sister Album.” This was the first time that I have been aware of her spending so much time by herself with the album. I usually look along with her but decided to see how she would do without my help. I was glad to see that she could appreciate what she was seeing; however, she did call on me frequently to identify people and to read some of the text. I was a bit concerned about her having trouble going to sleep, but we went to bed at the usual time. After all the rest she got yesterday, I expect that she will be ready to start the day a little earlier today. I hope so, but I also sense that her recent erratic habits with sleep and rest are another sign of the decline she is experiencing. Kate got up at 6:15 this morning. She went to the bathroom. Then she asked what she should do. I told her it was still early and thought she might like to go back to bed. She accepted my suggestion and stayed there until 7:30 when she got up again. I went to the bedroom to see if she needed anything. She wanted to know if she had something to do. She wasn’t specific, but it seemed like she thought she might have an obligation to be someplace. I told her the only thing on her agenda was to have lunch with Cindy. She is the sitter that I have tried to position as a friend who takes her to lunch while I go to Rotary. Of course, she stays longer than it takes for lunch, but Kate doesn’t have a sense of time. Then Kate asked what she could do “right now.” I told her I could take her to Panera for a muffin. She liked the idea. As we drove up to the restaurant, she said, “We’ve been here before.” We stayed less than an hour before she wanted to go home. We looked at a photo of her mother and father with Kate nestled in between them. I pointed to her mother and asked if she knew who that was. She hesitated a moment and then said, “My mother.” I asked if she knew her name. She said, “Kate.” I said, “That’s your name. She laughed, and I said, “Your mother’s name is Elizabeth.” Then I pointed to her father and asked who he was. She didn’t know but guessed that he was an uncle. We didn’t get but a couple of pages before she said she was tired and asked if we could look at the album later. I told her that would be fine, and she lay down on the sofa. She said, “I might not see you for three hours.” I wasn’t surprised. She had gotten up much earlier than usual. She needed the sleep. Kate has gotten up early on four or five days over the past two weeks. On the days when I felt I needed to wake her, I haven’t had any trouble. That changed yesterday when I tried to get her up for lunch with the sitter. She wanted me to leave her. I could, of course, have let her continue sleeping, but I felt she had slept enough. In addition, she hasn’t been as accepting of Cindy’s getting her up. On two occasions when I have done that, she has remained in bed too long. Once she didn’t get up at all while Cindy was here. The other time she got up so late that she didn’t have lunch until 3:00. By the time I got her up and dressed yesterday, Cindy had been here over twenty minutes. When I got home, Kate was on the sofa resting. I’m not sure how long she had been there. She continued resting while I put up a few groceries and checked email. At dinner, she asked if I knew what she was going to do when we got home. I said, “Go to bed?” She said, “That’s right.” I told her I suspected she would get her second wind after dinner. That is what usually happens. As we drove home, she said, “What can I do when we get home?” I told her she might like to work on her puzzles. She liked the idea and did so for almost an hour as I watched the news. Later when I told her I was going to take a shower. I suggested she come to the bedroom with me. She started to follow me but went to the bathroom for the guest room next to ours. I went to look for her when she didn’t return. I found her in the guest room under the covers with her clothes on and the light off. I suggested she come into our bedroom. She came with me. I put on a DVD of Les Miserables. She sat down in her chair with her iPad. It wasn’t long before she put the iPad down. She started to put on her night gown. Then she got in bed and lay down. She had been very lethargic all day, but she didn’t go to sleep. She was still awake when I got in bed an hour later. It was another day when she wasn’t cheerful. She just seemed tired, but it was also a day when she appeared to know me as her husband. As we drove home from dinner, she said something about my being a creature of habit. I said, “You think you know me pretty well.” She said, “I should.” I said, “Do you know my name?” She didn’t, but it didn’t bother her at all. She just wanted me to tell her, and we moved on. I’m hoping for a more cheerful day today. It was a year ago that I first noticed a change in Kate’s sleep pattern. Until that time she went to bed early, generally about 8:00. In the morning, she got up between 7:30 and 8:30. Last spring, she started sleeping later. In conversations with her doctor, I took her off Trazadone. That enabled her to stay up a little longer, and she was more awake at lunch than before. In general, she still sleeps later. Recently, however, she has been more erratic in the time she gets up. Most days I wake her. I usually start that process around 10:00 or 10:30. Other times she surprises me by getting up early. In the past week or so, she has gotten up earlier than usual. She was up before 8:00 Saturday. We arrived at Panera shortly after 8:30. That was two days in a row, and the third time we had been there in the past week. Prior to that it had been months since we had been there that many times in a week. A year ago, we went there almost every day. What should I expect next? I don’t know. She was up early enough yesterday to get to Panera again, and she was upbeat. She appears quite normal until she asks a question that gives her away or until she encounters a problem on her iPad. For example, she was up before 8:00 this morning and wanted to take a shower. She seemed fine, but she asked where the bathroom was. I showed her. She was cheerful and related to me very naturally. I could have assumed that she knew me. As I helped her into the shower, she said, “What is your name?” I told her and left her in the shower. When she was finished, she got back in bed. I sat down on the bed beside her. We chatted a minute or two. Then she said, “Who are you?” I said, “Do I look like someone you know?” She said, “I don’t know.” I said, “Well, do you think of me as friendly?” Again she said, “I don’t know.” I said, “The way you are talking to me sounds like you must think I’m friendly.” She hesitated and said, “Yes, I do.” I went on to explain that we are married and that we met at the home of one of her high school friends when we were students at TCU. That was the first moment that she seemed to fully accept that I am her husband. Despite these questions, she spoke with me as naturally as though she knew my name and understood that I am her husband. She did express surprise when I told her we were married, but she never looked confused. Only her words conveyed that. She was never afraid or concerned about not remembering who I am. She has only experienced an anxiety or panic attack a few times in connection with not knowing where she is or who she is. I am grateful for that. I don’t know how long this will last, but it may not be long until she changes again. Right now, it almost seems like we are living as though she does not have Alzheimer’s. Of course, that is not literally so, but it is a happy time. We’ll enjoy these moments as long as it is possible. It’s hard to know what to expect each morning. I do know that Kate sleeps later now than she did a year ago, but sometimes she surprises me by getting up early. I also know that she has always been “slow” in the morning. Over the past few years, she has also been a bit groggy when she wakes up. Sometimes she shows no signs of grogginess. That was true yesterday. Just before 9:00, I saw that she had rolled over in bed and thought she was about to get up. I walked into the bedroom. She was lying in bed with her eyes open running her fingers through her hair. She gave be a smile as I approached the bed where I sat down beside her. We chatted a few minutes. She was in a good mood and seemed very clear-headed but wanted to rest a little longer. Close to 10:00, I noticed that she was up and looking at the clothes I had put out for her. I went to see if I could help her. She didn’t seem as alert as she was earlier. She was trying to gather her clothes together to take them into the bathroom before showering. I offered to help, but she didn’t want help. She asserted her independence, and I let her. I went back to the kitchen where I could watch on the video cam. She went into the bathroom and didn’t come out for almost thirty minutes. I thought she must have showered. I went back to her. She hadn’t showered and wanted to go back to bed. An hour later, I tried to get her up. She wanted to stay in bed. I told her I would come back in thirty minutes, and we could go to lunch. When I returned, she still didn’t want to get up. She told me to go to lunch without her. I said I would feel uncomfortable leaving her. In a soft and gentle voice I said, “I’m ready for lunch and would love to take you. Why don’t you get up and come with me?” She agreed but didn’t want to take a shower. I decided not to push it. I started to help her get dressed, but she wanted to do it herself. I stayed in the room. She asked for my help once or twice. Once she was up she seemed fine. We didn’t talk much on the way to lunch. I played some music that she likes. The lunch went well. She brought up her mother and commented that she looks like her. I reminded her we have her father’s family movies from the mid-1930s to about 1945 and asked if she would like to look at them when we got home. She liked the idea. On the way home, she said she wanted to rest. She did just that when we got back. After an hour or so, I asked if she was ready to see the movies. She was, and we spent almost two full hours watching them. She needed help identifying people throughout the entire time. That related both to the quality of the films and her Alzheimer’s. The films were originally shot in 16mm, many in color. They had deteriorated a good bit before they were transferred to VHS tape and more recently to DVD. Her problem was more than that, however. The movement from one person to another made it difficult for her to know what to focus on. When I directed her attention to her mother or the few in which her father appeared, she could never see them. I would stop, rewind, and then stop again when her mother came into view. I am happy to say that she loved every minute of it. I thought that she might get tired. That never happened. She was captivated seeing her grandmothers, aunts and uncles, and cousins as well as her parents. She was especially excited seeing her mother along with the other graduates coming out of the auditorium and shaking hands with the college president after the ceremony. It is also fun to see Kate from birth to about four or five. We have lots of stills, but the movies are really special. After the movies, we went to dinner at a Thai restaurant. It was unusually busy. Kate was amazingly patient and never expressed the first complaint about the delay in our food. That surprised me because she usually thinks it takes a while for the food to arrive at any restaurant. In fact, she often asks, “Does this place have food?” only minutes after we have arrived or ordered. It was after 8:00 when we got home, so we didn’t have a lot of time before going to bed. Kate worked on her iPad. She continues to have more problems working her puzzles. That started last night when she had to ask my help just to open (lift the cover) the iPad. It was almost a year ago that Kate began sleeping later. That has continued to the present although she sometimes surprises me by getting up much earlier. During the past month, she seems to have had less trouble getting up even when I wake her. I am doing that more now, especially on Mondays. That’s the day the sitter comes an hour earlier (noon) than on Wednesday and Friday. We have had a new sitter, Cindy, for four weeks. On two occasions, Kate hasn’t gotten up the entire four hours she was here. I have a sense that Kate didn’t feel as comfortable getting up with her as she did with the previous sitter. That is leading me to make an adjustment in the way I prepare Kate. Yesterday, I made sure that Kate was up and dressed before Cindy arrived. In fact, we were ready early enough to make it to Panera for Kate’s muffin. We returned home at the same time Cindy arrived. That made for a smooth transition. I made another change I feel good about. In the past, I would have gotten lunch for Kate. That meant that Kate and the sitter had a full four hours to fill. A year ago that would have been no problem. Kate and the sitter regularly went to Panera for part of the time and spent the remaining time at home. Since that time, Kate has not wanted to go to Panera with the sitter. I suspect she felt less comfortable going there with a sitter as she became more dependent on me. I have kept them occupied by providing DVDs of musicals as well as musical videos on YouTube. On some occasions they have spent the whole four hours watching them. I’ve been looking for another diversion and think I have found something for them on Monday. Although I enjoy taking Kate to lunch, it is just too rushed for me that day. Even before Kate started sleeping later, I were too pressed for time getting her to lunch and back home by noon to meet the sitter. Sometimes I’ve asked the sitter to meet us at Panera or wherever we were having lunch that day. Yesterday I decided to have Cindy take Kate to lunch at Applebee’s. I thought that would offer them an informal situation where they could visit over lunch. That went well. Cindy said they were there quite a while. I plan to do that again. I wasn’t surprised to find that Kate was asleep when I returned at 4:00. She has often napped in the afternoon, but that has become more common lately. It is not unusual at all for her to get up in time for lunch and then take a nap immediately after lunch. At first, I was concerned that she might have trouble going to sleep at night, but she didn’t. Recently, that has changed. She used to go to bed around 8:30. Now it is closer to 9:30 and sometimes 10:00. In addition, she doesn’t fall asleep as quickly as she used to. She is almost never asleep when I come to bed. I haven’t worked out a plan to address the issue. Since it has been easier to get her up in recent weeks, I may try getting her up a little earlier. I would like that. That would enable us to have a more predictable lunch time. Like so many other things, I’ll have to see how it goes and be flexible. Normally, I have sitters for Kate Monday, Wednesday, and Friday afternoons. Yesterday was a rare exception. I had an early luncheon meeting across town and arranged for our Monday sitter, Cindy, to stay with Kate from 10:00 to 2:00. I knew when I made the arrangements that Kate might be sleeping when I left, but I hoped she might at least be ready to get up. As it turned out, she was not. When Cindy arrived, I took her into our bedroom and told Kate that she would be there to help her with anything she needed. I pointed out Kate’s clothes to Cindy and started to leave. She asked if she should try to get Kate up. I told her that she had been up very early yesterday but that she should try to get her up at 11:30. After my luncheon at 1:00, I checked the video cam and noticed that Kate was not up. When I arrived home, I discovered that Cindy had tried to interest her in getting up at 11:30 and again at 1:00. Neither time did Kate want to get up. When I went to the bedroom, I found that Kate was awake but still in bed. She was quite relaxed and smiled as I came in the room. I walked over to the bed and asked if she would like to get up. At first, she said she didn’t. Then I told her it was getting late and I thought it would be good for her to get up and get a shower. She agreed and got up without a problem. I was disappointed that she hadn’t gotten up for Cindy. My suspicion is that she didn’t remember her and, thus, did not feel comfortable getting up for her. I think she felt secure staying in bed the whole four hours. Knowing her memory is so short, I know that she couldn’t have remembered that Cindy was there or that I was gone. I imagine it was one of those moments of confusion for her, and she didn’t know what to do except stay right where she was. She seemed to recognize me from the time I walked in. She didn’t ask my name or how we were related at all. When she was dressed, she was ready to eat. That was no surprise. By then, it was 3:00. I took her to Panera for a muffin and half a sandwich. She was very cheerful and talkative when we entered the restaurant. I don’t remember doing this before, but we both walked to the counter where I placed our order. I said hello to the young woman employee. Kate said, “My name is Kate, and this is my uncle.” I said, “Are you sure?” She said, “You are, aren’t you?” I told her I was her husband. Then she said, “If you say so.” She left to get her drink. Then I asked the woman who is a new staff member if she knew that Kate has Alzheimer’s. She didn’t. I didn’t have to go any further she understood the situation. I was eager to see if she had picked out a table and, if so, which one she chose. She never remembers the two tables where we typically sit. When I reached her, she was standing at a table where a young man was working on his laptop. She was talking with him. When she saw me, she said to the man, “This is my uncle.” I didn’t contradict her. I began to open the puzzle app on her iPad and place on the table across from the man. She continued talking with him. He was trying to ignore her. He kept on working. We left after forty minutes for her to get her hair shampooed. This was the first time I have taken her just for a shampoo. I did so because I don’t think she is shampooing regularly at home. As we were walking out, she stopped to talk to a young boy about seven or eight who was seated across the table from a man I believe was his tutor. The boy’s backpack was sitting on a chair between the two of them. Kate thought the backpack was a baby and asked the boy if that was his brother. They quickly cleared up the mistake. The man was black and the boy white. Then Kate looked at the man and said, “You must be his mother.” Of course, the man said he wasn’t. 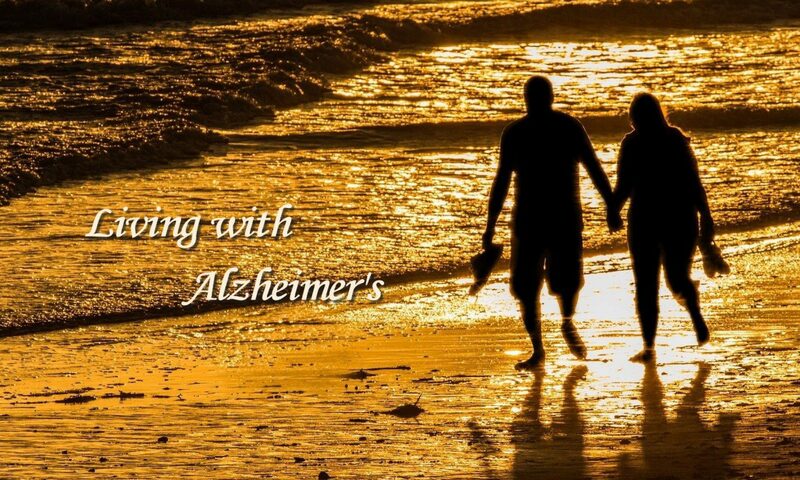 Before we walked away, I pulled out one of “My wife has Alzheimer’s” cards and slipped to him. From there we went to the hair salon. When Kate was finished, she walked to the front with her stylist and said, “She’s really good.” Then she looked at the stylist and said, “What’s your name?” She told her, Kate repeated it. Then she asked her again. After that she said, “You may have to tell me again.” The stylist has long known about Kate’s Alzheimer’s and handled the situation perfectly. We had a nice dinner experience at Casa Bella. This wasn’t a music night for us. We sat in the front section where we have eaten for years until they started having music nights on Thursdays. We’ve been eating there for almost forty-seven years, but she forgot the name of the restaurant sometime during the past year. Last night she probably asked the “name of this place” seven or eight times. She talked a good bit about feeling glad to be with me. She specifically mentioned that she wouldn’t know how to get home. I discovered in the process that she was interested in knowing the name of the restaurant in case she were to get lost. She would be able to tell someone where she had been. Soon after we had ordered, she wanted to go to the restroom. I took her and waited outside the door for her. I told her not to lock the door that I would make sure no one else went in. When we returned to the table, she thanked me and said she would never have been able to find her way back. It’s only when she says things like this that I get a grasp of the fact that she still recognizes her own disabilities. Near the end of our meal, a couple we know from Broadway nights were seated in the booth next to us. We had a nice conversation with them for a few minutes. It was another of those brief social encounters that enrich so many of our meal times. Off and on throughout dinner, Kate said she was tired and wanted to get to bed early. She often says this but doesn’t follow through when we get home. As usual, she worked on her iPad for a while but was tired and called it a day shortly after 8:00. That is at least an hour earlier than normal. She was still awake when I got in bed at 9:45. It was a very short day for her but a happy one. As I had expected, Kate didn’t want to get up yesterday when I left her to attend my luncheon. I had prepared the sitter that she might want to sleep much longer. I even mentioned that if they were just getting to Panera for Kate’s lunch around the time I was to return home, I would meet them there. What I didn’t expect was to find that Kate was still sleeping soundly when I got to the house a few minutes before 2:00. The sitter told me she tried to get her up three times. Each time Kate said she wasn’t ready to get up. After the sitter left, I went to the bedroom and sat down on the side of the bed where Kate was sleeping. She opened her eyes and smiled. That was a good sign. I asked if she were ready for lunch. She said, “What do you want me to do?” I told I thought she should get dressed and let me take her to lunch. She got up without any coaxing. It was a little after 3:00 when we left. I decided it was too late for lunch and went to Barnes & Noble where she got a muffin. We arrived there close to 3:30. After sitting down at a table, Kate asked me at least four times in a short period of time where we were. She had done the same thing a couple of times in the car on the way there. It wasn’t long before she said, “Don’t play games. Are you going to tell me where we are or not?” Of all the times she has asked something over and over, she’s never said that before. That didn’t end it, of course. Within a few minutes she asked again. Knowing that the muffin wouldn’t hold her long, I decided to leave for dinner before 5:00. This would not have been the first time we have eaten so early. (I remember growing up in West Palm Beach. We used to joke about all the old folks who came down from the North to spend the winter. There were lots of restaurants who catered to them and had early bird specials that drew large crowds. Now I understand a little better why they ate so early.) I think it makes sense for us to get back home early. Kate seems to go to bed earlier when we do that. I like to think that it keeps her from sleeping so late in the morning, but I’m not sure that works at all. Our day ended very much like the day before. I watched the news while Kate worked on her iPad. Once again, she was struggling to understand how to work her puzzles. I fear that she may lose this ability far sooner than I care to believe. When I saw her put down her iPad in frustration, I walked over to her. She said she was tired and thought she would get ready for bed. I got her night clothes for her and went back to what is becoming our best friend, YouTube. I began with a video of Renee Fleming singing an aria from the opera Norma. Neither of us has seen the opera. Prior to a few weeks ago, I had never heard the aria. I discovered it while browsing YouTube for something new to watch. It is a beautiful aria, and Kate was mesmerized. She didn’t get out of her chair until it was time for bed. We watched a pot pourri of music videos before then. After Renee Fleming, we watched a beautiful choral rendition of Samuel Barber’s “Adagio.” We followed that with music by The Piano Guys, The Tabernacle Choir, and an orchestral flash mob playing “Waltz of the Flowers” in a shopping center in Israel. This brought back memories of my childhood. I loved it the first time I heard it in the sixth or seventh grade. I can’t tell you how engaged Kate was during all of them. She was more emotional than usual, at times bordering on tears. The last video was The Tabernacle Choir singing “Come Thou Fount of Every Blessing.” It had quite an impact on Kate. Ten minutes afterward she still shed a few tears. Because music has been so important to me, I have taken great pleasure in Kate’s enjoyment. It’s not that she hasn’t always liked music. It has played a big role in our marriage. Alzheimer’s seems to have enhanced both the impact of music and the breadth of types of music she enjoys. She doesn’t like everything. She is actually bothered by most of the music we hear in restaurants, but that leaves us with a broad range of music that we both like. With her memory loss, conversation is difficult. But it is a real joy to sit with her in our own house listening to music together and being as moved as we would have been in the grandest concert hall. These are moments I will cherish in the days ahead. As I have mentioned in recent posts, Kate now sleeps later than she used to although sometimes she surprises me. Today was one of those. I was listening to a book by Donna Leon while taking a 30-minute walk around the house. (Yes, I know it sounds boring to walk in the house, but listening to books helps. Besides I no longer feel comfortable leaving Kate alone.) Just as I was ending my last circle from kitchen, to family room, to living room, to dining room, and back to kitchen, Kate opened the door to the family room. It was 7:30, very atypical for her. In fact, I think this would be the earliest she has gotten up during the past eight or nine months. When I walked over to her, she asked, “Where are my clothes?” I often put them out before I go to bed but didn’t do so last night. I intended to do that this morning but thought I would have more time. I told her I would help her. She asked again where her clothes were. I detected that she wasn’t just asking the location of her clothes for the day. She was looking for all of her clothes to pick out something. She no longer knows where we keep anything. A little later I discovered that she had been in my closet. She was no doubt looking for her things. I walked her back to her room. As we walked along the hallway, she stopped to look at a picture of her mother when she was in her late teens or early twenties. She said, “Who is that?” I told her it was her mother and said, “She was a beautiful woman.” She said, “Is she gone?” I told her she had died thirteen years ago. She was sad. Then I showed her pictures of her grandparents and the old Franklin home in Fort Worth. When we got to her room, I asked if she would like me to pick out something for her. She did. I gathered several things together, and we walked back to our bedroom. I laid out her clothes on the bed and she said, “Don’t you want me to take a shower?” I told her that would be nice, and she said, “Who are you?” I gave her my name and explained that I am her husband. She was mildly surprised but not alarmed by the news. We walked into bathroom where I turned on the shower and left her to bathe. For what I believe is the third day in a row, Kate has gotten in bed right after returning from lunch. There were times like this in the distant past; however, they usually occurred after she had gotten up early that morning. She has often talked about being tired, but she has never acted on that the way she is doing now. She won’t rest as long today because I made an appointment for her to have a massage at 3:30. After that, we will have about an hour before leaving for jazz night at Casa Bella. It will be telling if she rests again during that break.